Who doesn't love a great piece of Apple-themed art? Then again, once you've seen Adam Reeder's sculptures, is there anything that can top them? With all due respect to Mr. Reeder, perhaps a serigraph by Andy Warhol. 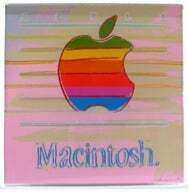 Warhol did a 38-inch by 38-inch silkscreen color print of the Apple logo some 24 years ago—this one is number 142 of 190—and it's signed in the corner by the iconic New York artist. It was commissioned by none other than Del Yocam, who ran the Apple II group back in the 1980s and later became Apple's first chief operating officer. He currently sits on the board of Adobe Systems. Apparently, there have been other similar reprints that are floating around (like this one that went for sale in 2007). But this one is the real deal—bidding is expected to get into the $20,000 range. The auction will be held May 6th at 7 pm at O'Gallerie in Portland, Oregon. As they say, bid early, bid often.